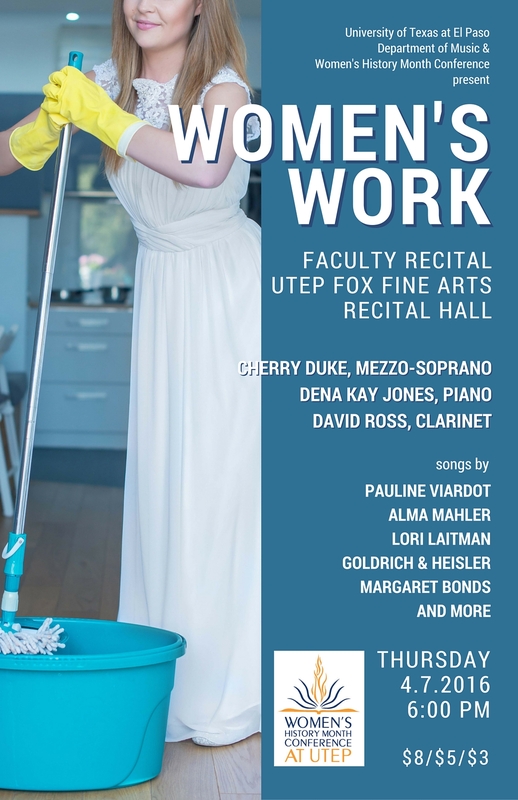 UTEP music professors Cherry Duke, mezzo-soprano, Dena Kay Jones, piano and David Ross, clarinet, present works of female composers, April 7 in conjunction with the Women’s History Month Conference at UTEP. 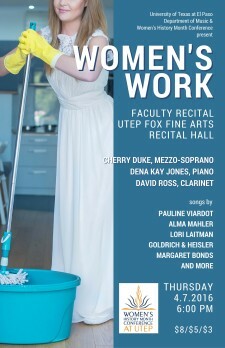 El Paso, TX—Mezzo-soprano Cherry Duke and pianist Dena Kay Jones with special guest David Ross, clarinet, perform “Women’s Work” at UTEP’s Fox Fine Arts Recital Hall on Thursday, April 7, 2016 at 6pm. “Women’s Work” features classical works by Pauline Viardot, Alma Mahler, Lori Laitman and a set of popular tunes by Mary Rodgers, Lucy Simon, Goldrich and Heisler and Margaret Bonds. Alma Mahler, best known as Mrs. Gustav Mahler, was forbidden by her famous husband to continue with her blossoming composition career. But after his health and their marriage began to fail, he reconsidered and helped his talented and eccentric wife publish her songs. “Her songs are wild, torrid; indicative of the intensely passionate love affairs she was known for, before, during and after her marriage to Mahler,” says Duke. 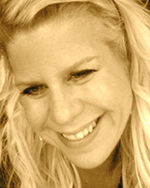 Lori Laitman is a contemporary award-winning composer known for her art songs. Her pieces in this program are from her oratorio, Vedem inspired by “The Boys of Terezín.” Commissioned by Music of Remembrance, these songs are based on the writings of teenaged boys who were imprisoned in the infamous Theresienstadt concentration camp. “Women’s Work” debuted at Converse College on Thursday, March 3, 2016 and will be performed at Fox Fine Arts Recital Hall at the University of Texas at El Paso on Thursday, April 7 at 6 p.m. Tickets are $8 (or $5 for seniors, military, non-UTEP students) and $3 for ages 6 and younger, UTEP students, faculty and staff. Cherry Duke is an active soloist in opera, oratorio, musical theater and concerts nationwide and abroad. She is a frequent collaborator with contemporary composers who create works that blend classical techniques with popular styles. In 2015–16, she had company debuts with Los Angeles Opera, Fort Worth Opera and the acclaimed New York City contemporary opera festival, Prototype. As a principal singer in the original cast of the “modern masterpiece,” Dog Days by David T. Little and Royce Vavrek, she will be featured on the official recording of the opera, due out this year. Cherry Duke will debut with the El Paso Symphony in April as the alto soloist in Beethoven’s Symphony No. 9. She is also a member of the American Spiritual Ensemble, which is dedicated to the preservation of African American Spirituals. Ms. Duke is the recipient of many awards including the Connecticut Opera Guild Young Artist Competition, the Liederkranz Competition and the Metropolitan Opera National Council Auditions (New York District). She holds undergraduate and graduate degrees in vocal performance from Texas Woman’s University and The Hartt School at the University of Hartford, respectively. Ms. Duke joined the voice faculty of the University of Texas at El Paso in 2015 and serves as the Director of Opera UTEP. r musician throughout the United States and in Spain, Mexico, Italy and Canada. In addition to maintaining a widely varied repertoire from the standard piano literature, Dr. Jones has focused her energies in the performance and research of Spanish piano repertoire. Her debut album entitled Luces y Sombras: Piano Works by Joaquín Rodrigo was sponsored by the Spanish Embassy in conjunction with U.S. Universities and released in 2007. A second recording project Haunted America Suite was released in 2015 by Summit Records, where she is a collaborative pianist with Jim and Celeste Shearer. A native of the Central Illinois area, Dr. Jones received both the Bachelor and Master of Music degrees in piano performance from the University of Illinois. Her principal teachers in Illinois were Wilma Zonn, Lydia Artymiw, William Heiles and Andrew DeGrado. In August of 2001, Dena Kay Jones completed the Doctor of Musical Arts program at the University of Arizona in Tucson, Arizona, where she studied with Steinway artist Nohema Fernández. She joined the music faculty of the UTEP in 2002, where she is the Piano Area Coordinator and teaches applied piano, music and culture—as well as chamber piano. Dr. David Ross is Professor of Music at UT El Paso, and has served as Principal Clarinet of the El Paso Symphony Orchestra for many years. He was a scholarship student at the Oberlin Conservatory of Music, and completed his graduate degrees at the University of Iowa under the supervision for Himie Voxman, the noted woodwind pedagogue and scholar. David completed his formal clarinet studies with work with two of the world’s leading clarinetists: Larry Combs of the Chicago Symphony Orchestra and Jack Brymer of the London Symphony Orchestra. In addition to his studio work, Dr. Ross has taught various music history courses, both at the undergraduate level and for graduate students, and supervised the graduate program in the Music Department for a number of years. David has been an invited performer at international music festivals, and has performed, lectured, and given master classes at a number of music schools, both here and in Europe. He is also well known as a scholar, writer, and reviewer, with some 40 publications to his credit. 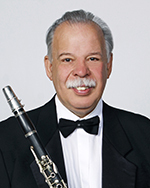 He has recorded for several music labels (DG, Orion, CRI), and is an enthusiastic and expert performer on period (historical) clarinets, with performances and recordings with professional period instrument orchestras and chamber groups in Germany, England, Italy, and on both coasts of America.